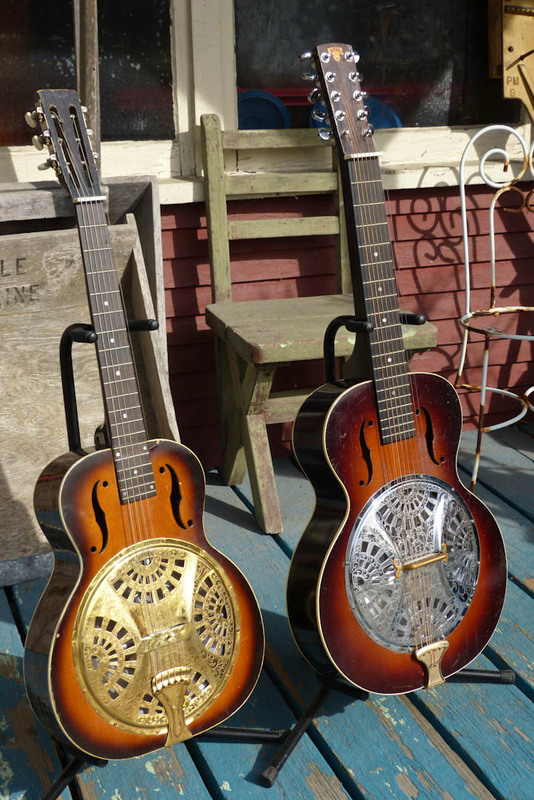 A customer of mine brought these two guitars in for show-and-tell. 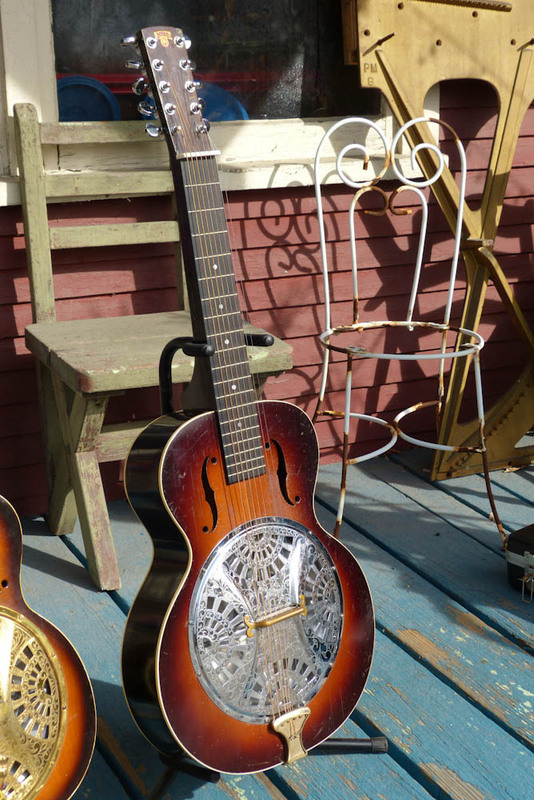 The one on the right is (originally) an 8-string 1938 Dobro "Norwood Chimes" squareneck model and the one on the left is a 1936 14-fret "squashed 000" body shape roundneck model (set up for Dobro/Hawaiian stringing). Both have replacement engraved coverplates which are late 60s/early 70s units done-up by a shop down the street from the actual Dobro factory at the same time. 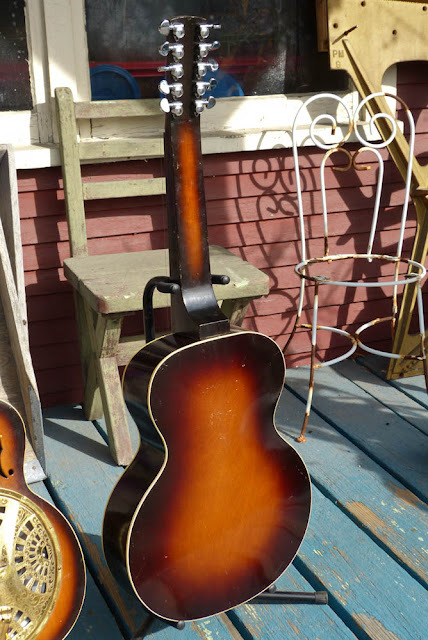 The Norwood Chimes is an elegant guitar and we've confirmed via in-store comparison with a period Regal-made archtop guitar (a Slingerland Songster) that the body outline and arched back is a direct borrow from the Regal 16" archtop template from the same time. 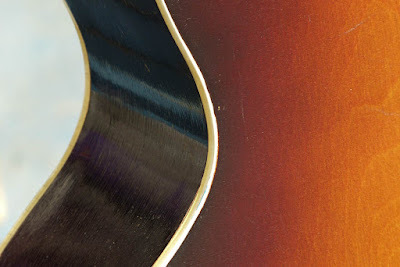 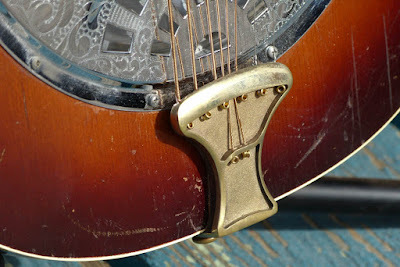 That confirms that part of the Slingerland connection with Regal for me as well (as most -- if not all -- of the Dobro bodies were made by Regal at this time). 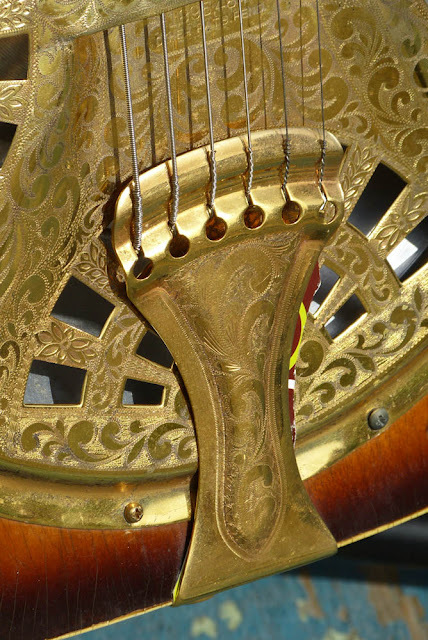 The tailpiece is an Allen unit and the wrist rest is a brass drawer pull. 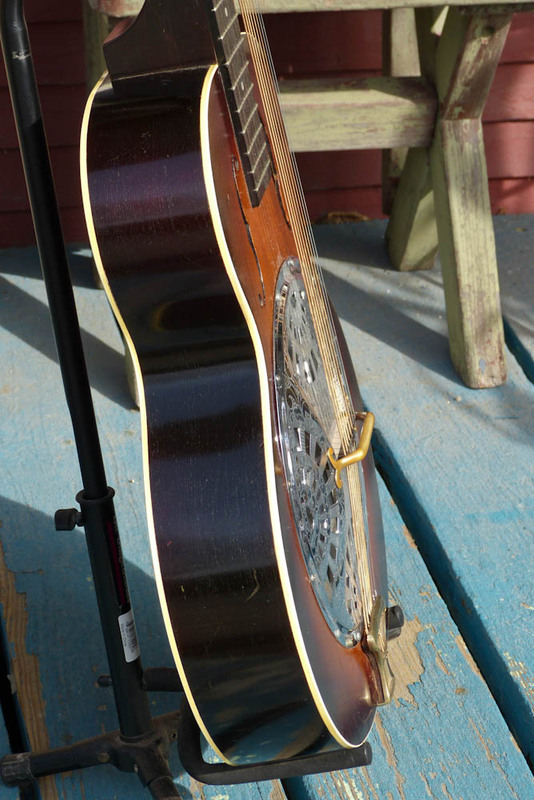 I know -- how great is that? 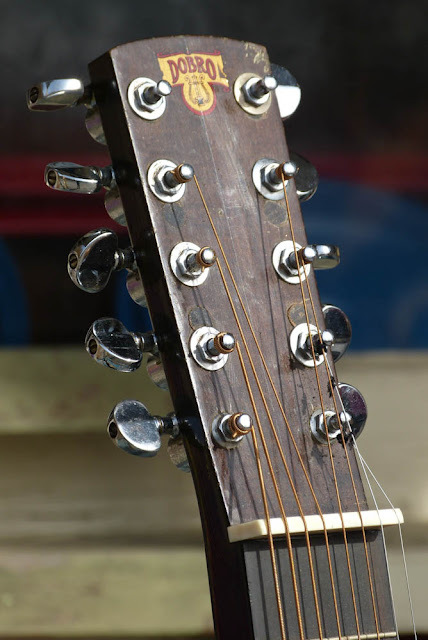 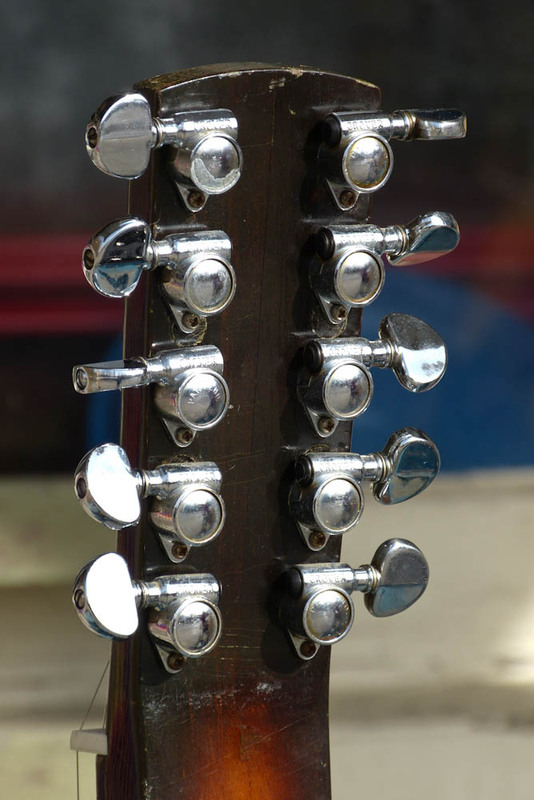 Unforunately, some doofus converted this to a 10-string (come on, where's the string spacing for that?) 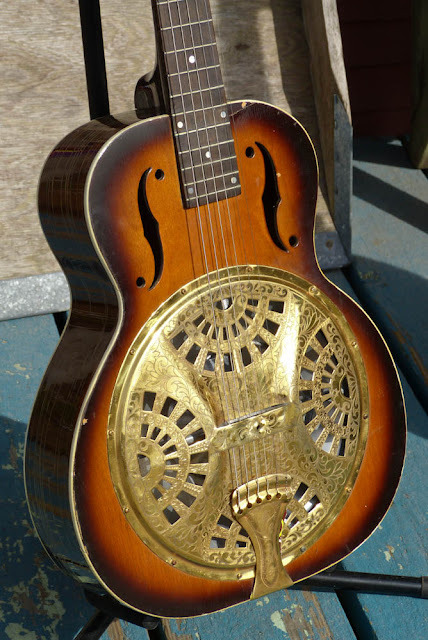 but the current owner uses it as an 8, which was its original configuration. 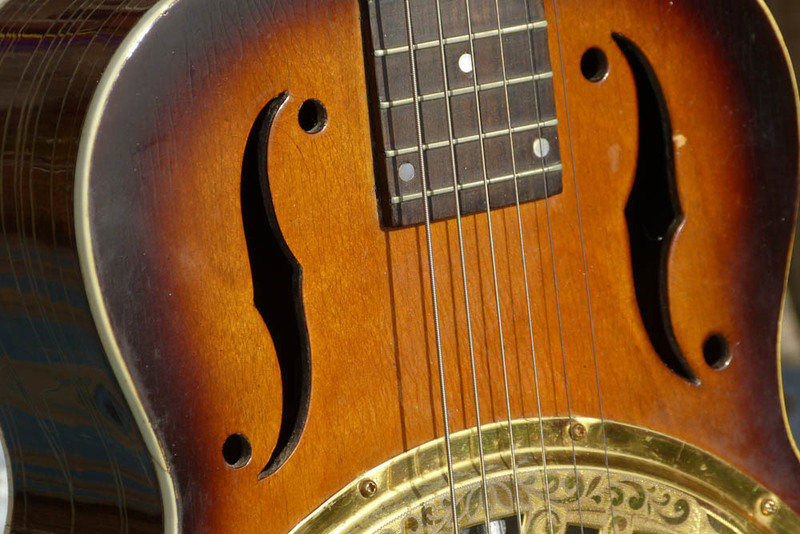 The tone is relaxed, sweet, and surprisingly jazzy/clean with more of a "console steel" overtone sequence rather than a typical Dobro honk and drop-off swell. It's a curious beast -- I've never heard a Dobro quite like it. 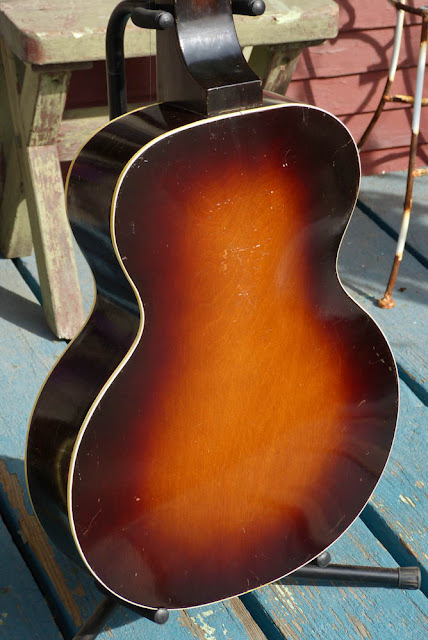 The back is arched. 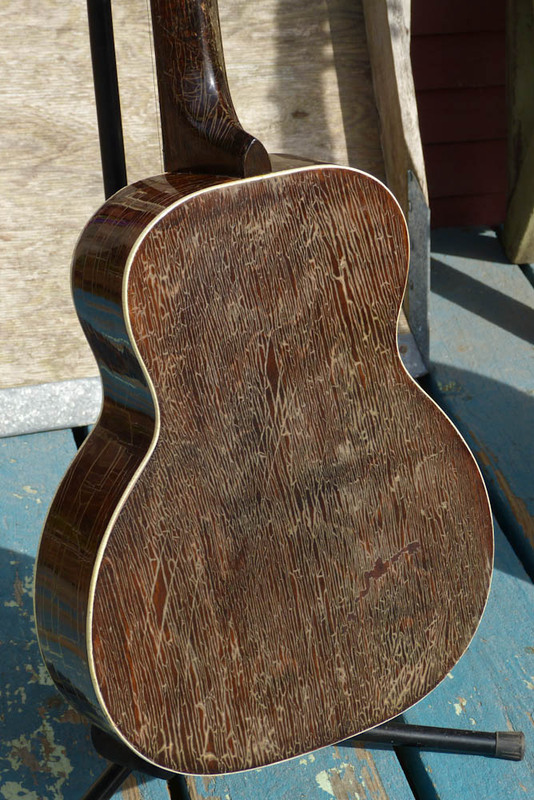 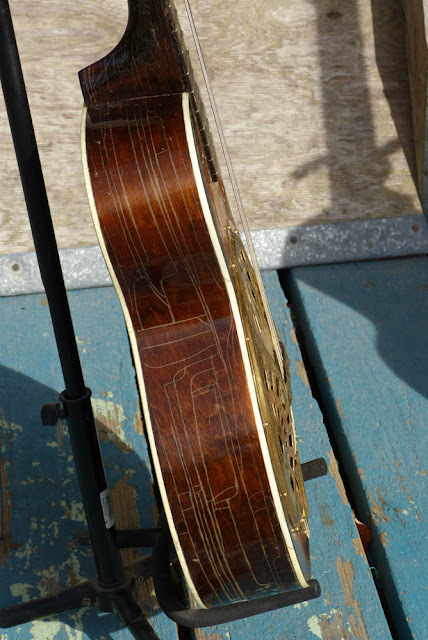 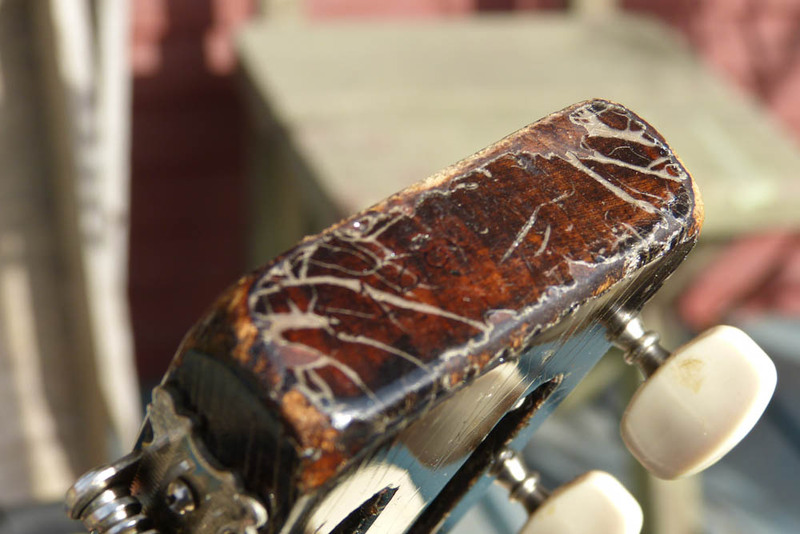 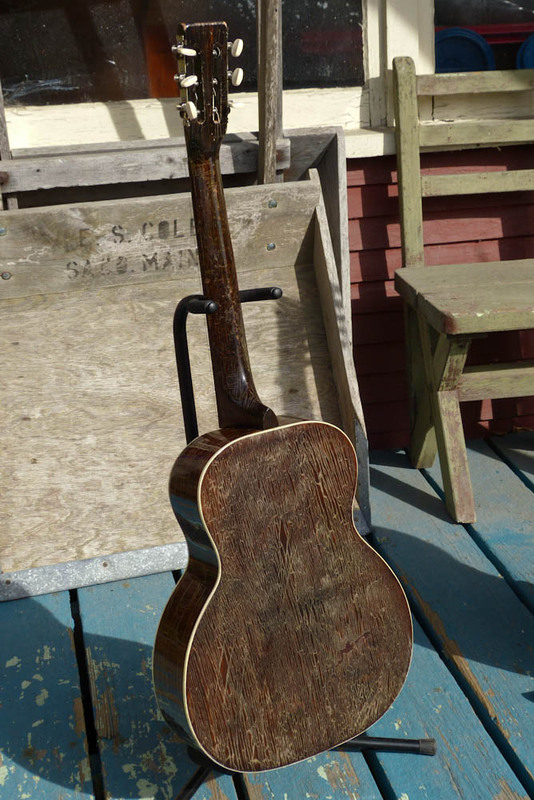 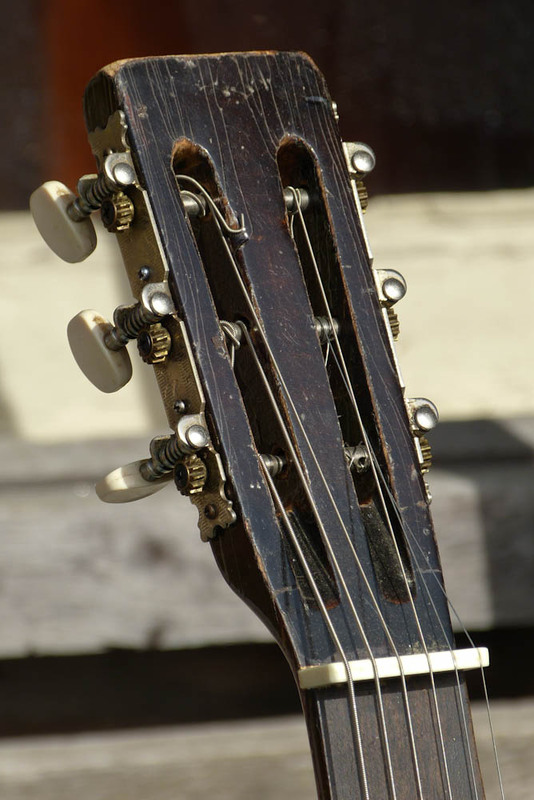 Both the back and sides are solid birch rather than ply which was used on the typical Dobro bodies. 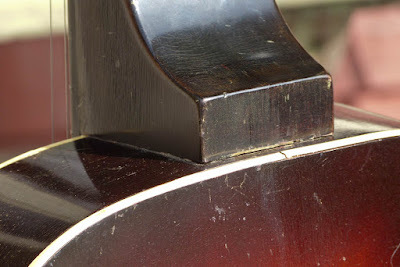 The top is ply, though, to help support the cone. The squashed-000 shape is similar to other Regal-made squashed-000s I've worked on, but has a slightly more pinched waist and the top binding that gives it a different look. 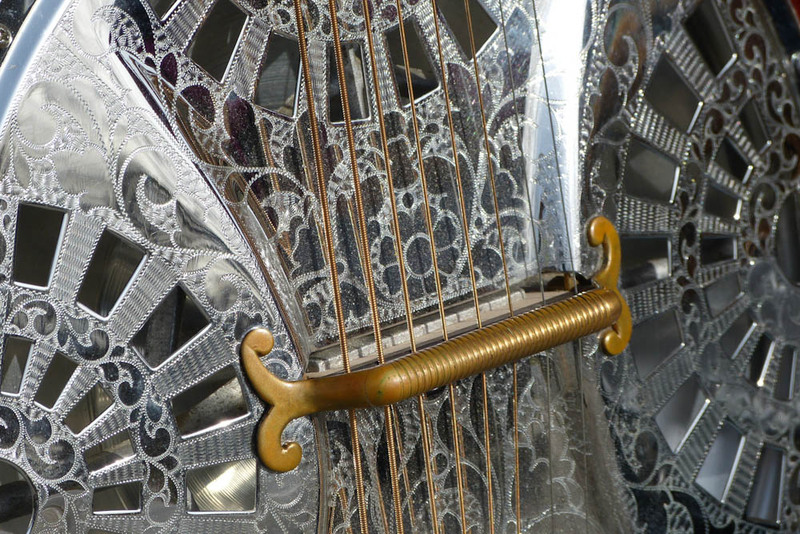 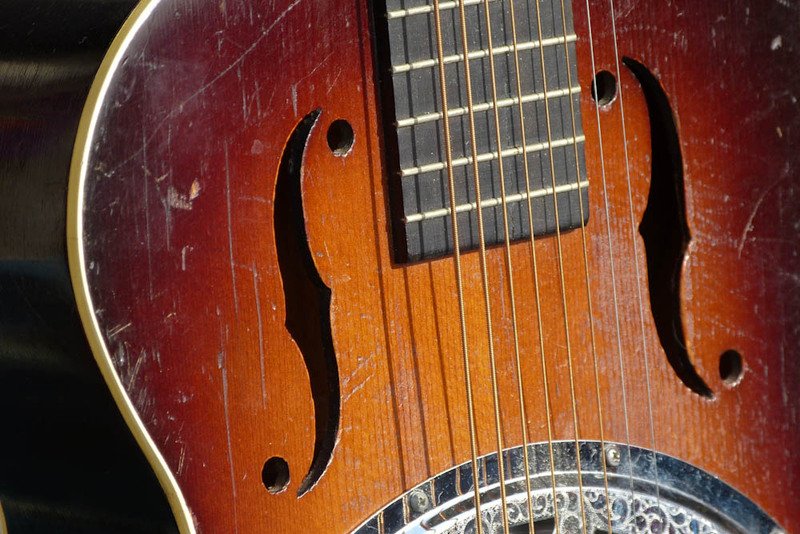 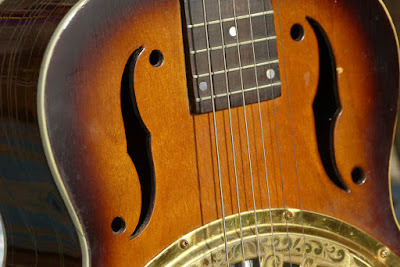 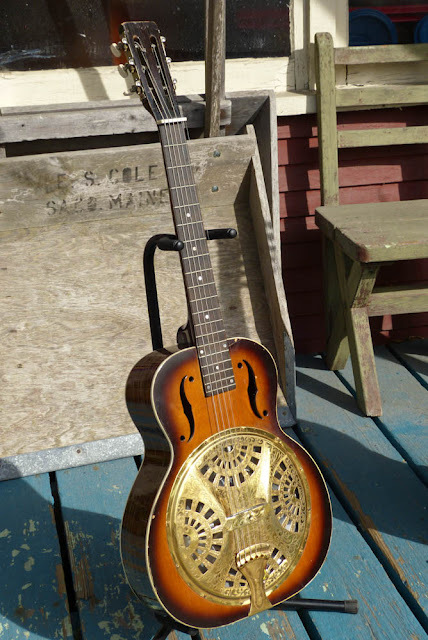 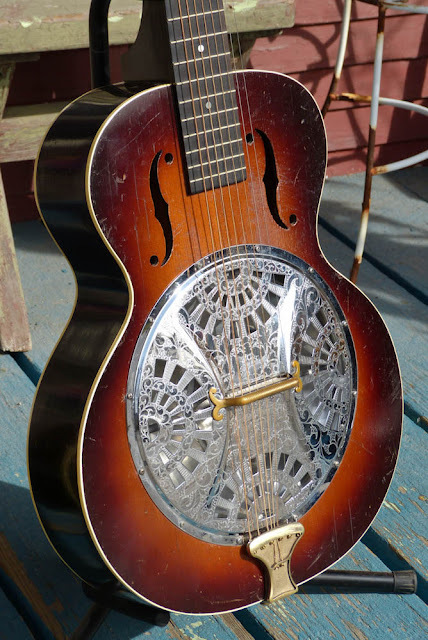 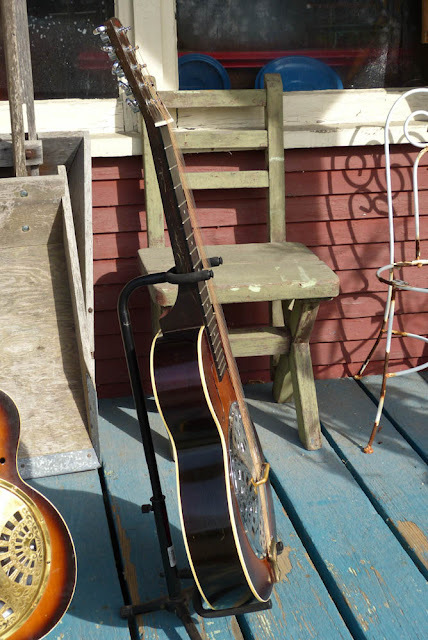 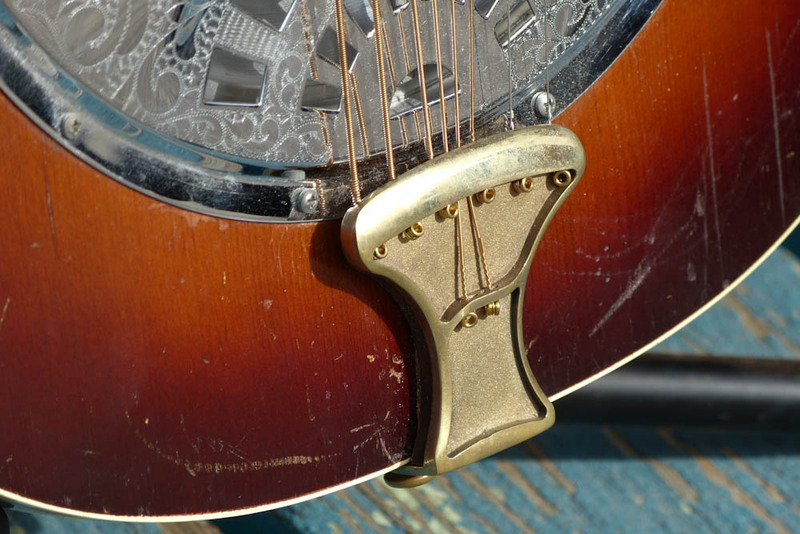 Compared to the Norwood Chimes model, this 1936 Dobro sounds like any other rank-and-file Dobro from the 30s and has that sort of subdued honk to its sound. 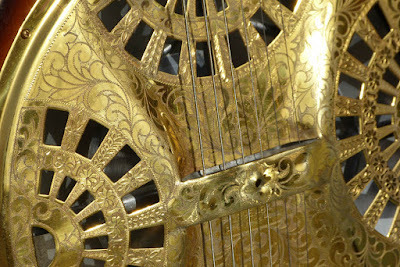 The engraved, gold-plated hardware, however -- really gives it a boost! The finish appears to have been oversprayed in the past and the top layer is doing this cool stuff.